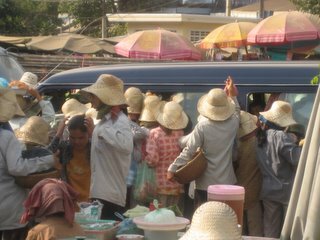 Any traveller who has spent time in this part of the world will agree that (no matter how wonderful the rest of the experience is) the constant bombardment by vendors and touts and moto/tuk tuk/cyclo drivers is absolutely exhausting and even surreal at times. On the plus side, we now know how to say "No thank you" in a number of new languages. I don't know what the solution to this is, other than hoping that the standard of living and incomes in these countries improve. We wish we could explain that they actually might make more money if they would stop the hard sell/overcharging tactics that turn so many people off and can keep them away. I would frequently be willing to pay a slightly too high fixed price to avoid the hassle of having to negotiate everything and be always on guard against getting ripped off. In Hoi An, they seem to have gotten the message as the touts for the tailor shops have been clamped down on to a huge degree. Without that change in policy, we wouldn't have spent more than 1 day there as we would have been too exhausted and turned off by the onslaught. But since it was manageable, we stayed for multiple days, spending money across the town and even buying something from one of the clothing shops. So maybe there's hope. Another random observation: Brian and I wonder whether a significant portion of the population in SE Asia suffer from hearing loss or injuries. We are constantly amazed by (and in serious pain from) the volume of life around here. Whether it is horns blaring on the road 24/7 (and constantly on a bus journey), the live music and miked performers at the Water Puppet Theater, or the karaoke music videos being blasted on the buses, we find ourselves wincing in pain and actually putting our fingers in our ears to try and lessen the impact. We can't imagine living through this on a full-time basis. Between the pollution we've breathed and the ringing ears, we hope this 4 months in Asia doesn't have permanent detrimental effects on our health. sadly I would have to agree with you. on our own trip the worst part was having to constantly be on guard. making sure you didn't get robbed, making sure you didn't get ripped off when buying something (still happens anyway), and just the general fending off of people. it is absolutely exhausting, and one of the reasons I'm not actively trying to make it back to SE Asia. glad your trip is going well. love the blog!